I mentioned before but I still can't believe my kids are back to school in 2 weeks. My little girl is going to be a first-grader! It's such an important milestone. She's excited yet nervous at the same time. We finished our school supplies shopping yesterday. Thank goodness! It was so chaotic. Is anyone interested in a back to school shopping post for kids? Let me know if you're. I'll be happy to put together a list of what I picked up for both of my daughters. Let's talk about the design! I love the fact that this bag only opens half way. Some bags open all the way and things tend to fall out easier. You can definitely open and close this bag while wearing it and your stuff is guaranteed to stay put. The lining is summery and vibrant. Please keep in mind that the bag has a bit of smokey smell to it but it is slowly going away. Based on the description "these bags are sunbaked and smoked over coconut husk as part of the finishing process, to bind the rattan to ensure it's resilience as well as give it a darker tone". Just let it air out for a few days and the smell will fade. Another thing I love about this bag is that it can hold a ton of stuff. I can fit my iPhone X, my compact wallet, sunglasses, chapsticks, key and there's still more room to spare. Do not underestimate how much this little bag can hold. It fits everything you might need for a summer night on the town. All in all, I love it and highly recommend Gonics Bali shop. 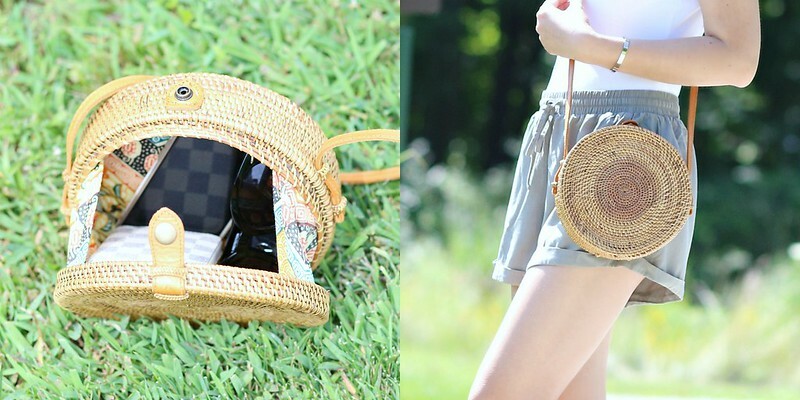 This bag is perfect for trips to the pool, beach or any summer activities. 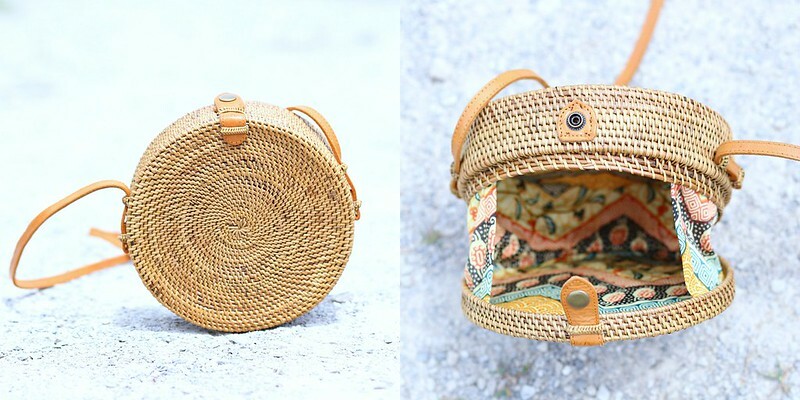 If this bag isn't your cup of tea, Gonics Bali offers a wide range of handbags made of natural materials. Check them out if you're interested!